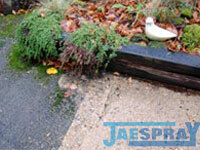 Is your driveway, patio or decking not looking its best? Time and the weather takes its toll on many hard surfaces. They quickly become covered in moss, algae, dirt and stains - making them look unsightly and creating a potential slip hazard around your home and garden. We can help return these surfaces to as good as new condition - saving you money in replacement costs and enabling you to relax and really enjoy your garden to the full this summer. Our affordable cleaning services can help you sell your property for more money. Giving it a bright, fresh look and that all important eye-catching, kerb appeal to a prospective buyer! For a FREE, no obligation estimate, contact us today.